BUY THE DISC Add the complete series to your collection. Visit our online store. Take highlights from The Land Between series with you on your iPhone or iPad. Check out our YouTube channel to view highlight clips from throughout the series in High Definition. Watch for The Land Between series on TVO. Check out TVO's program page for The Land Between for upcoming broadcast dates. There are so many amazing stories in The Land Between, that we couldn’t possibly fit them all into a three part series. Visit the "additional stories" playlist on our YouTube channel to learn even more about The Land Between, including: the story of the Whetung Store, the mysterious French Clochette artifact found near Sparrow Lake, the Pheylonian Candle Makers, the Otonabee Conservation Authority, and more. To learn more about how this non-profit project was created, visit the Ontario Visual Heritage Project website. This project was created in partnership with The Land Between Circle. Become a friend of The Land Between Circle and support conservation, economic development and education. 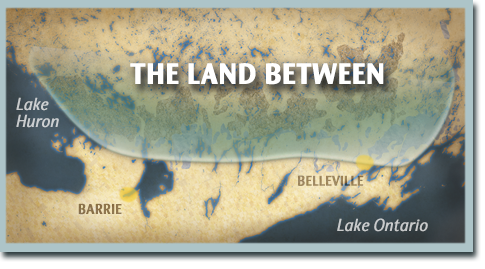 Join the community for The Land Between ecoregion in Ontario, Canada!